The many (and nowhere near complete) faces of Lex Luthor. 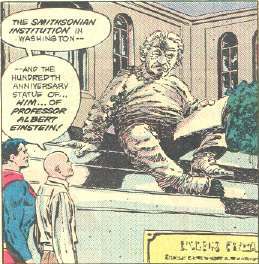 Superman Through The Ages has a comprehensive overview of our favorite bald villain, as does Wikipedia (at least until Luthor complains and the entry is reduced to just his bibliography). 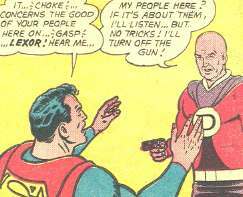 More “Many Faces of Lex Luthor,” this time from TV and movies. And here’s Kevin Spacey as Luthor from the forthcoming new movie. 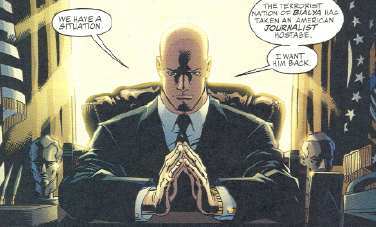 DC Comics’ official Lex Takes the Presidency page, complete with Shockwave campaign ad. 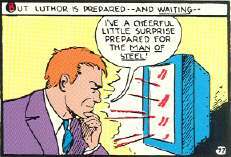 Comparing and contrasting the comic book origins of Luthor with his counterpart on TV’s Smallville . Who will win in the battle of the (previous) century? Khan versus Luthor, or Luthor versus Dr. Doom – you be the judge. “Bin Laden as Lex Luthor.” Er, um…. 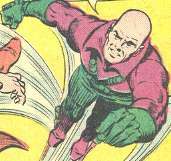 Fred Hembeck presents: Brainiac and Lex Luthor! This lucky fella has a “Baldy Award”autographed by Mr. Luthor himself! The original Mego Luthor Pocket Super Hero from 1979. And here’s the Super Powers figure. …And here are some custom figures, including probably the only Earth-3 Luthor figure you’ll ever see. The Planet Lexor, where Luthor was a hero and Superman was the villain! Information about the Silver Age Luthor’s estranged sister. Luthor only made it to number 4 on this list of Evil Geniuses? Bah! 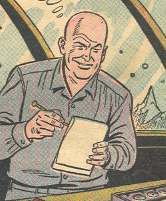 Luthor is also on the Forbes Fictional Fifteen richest characters list. Here’s a biography that’s a couple years out of date, but gives you an idea of what the post-Crisis Luthor is all about. The Luthor Hero Clix figure. The absolutely genius Lex Luthor mini-bust.